I enjoy a sleep-in as much as the next guy but when Melbourne’s emerging, new established, artisan and underground bakers come together for a winter bake sale, I’m there. 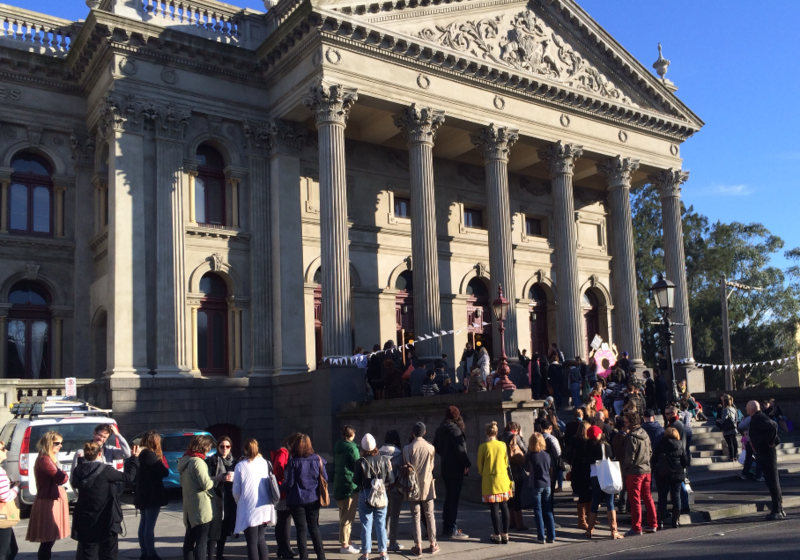 The Flour Market was held at Fitzroy town hall this morning and there was an abundance of indulgent pastries, breads, cakes, pies, donuts and much much more. 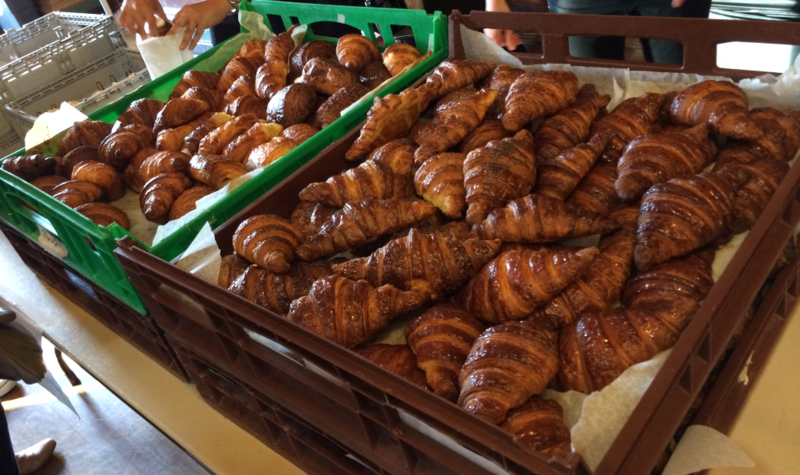 We walked in and there were crates full of golden croissants. 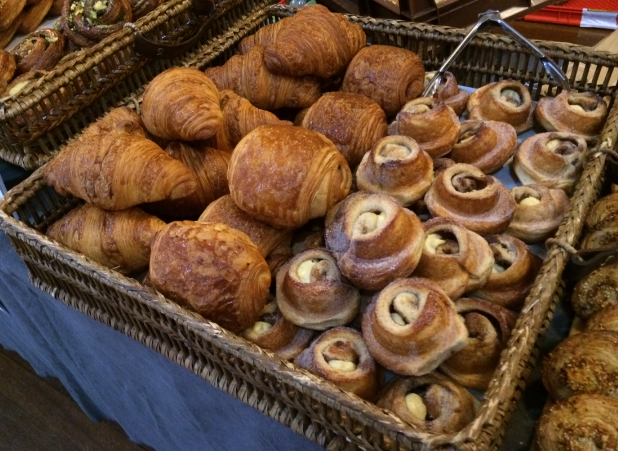 Agathe Patisserie had deliciously buttery croissants, plain and chocolate. They also had little brioche swirly buns with Nutella and custard meringue ones too. Yum! GF Precinct had a nice variety of freshly baked Gluten free breads. 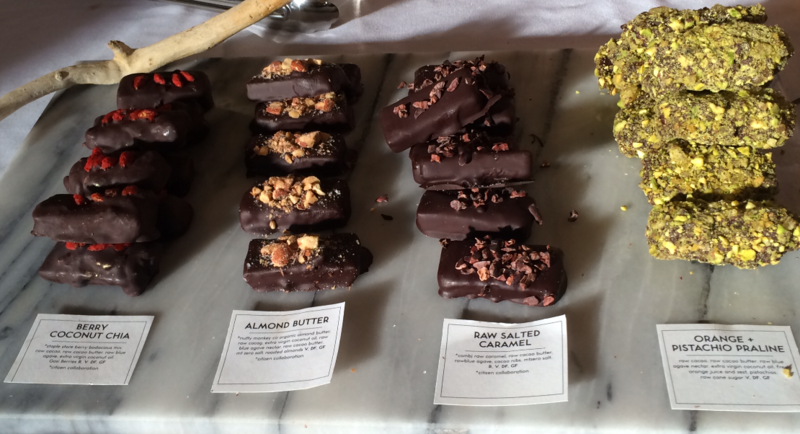 There were some interesting truffles displayed by Citizen Cacao, which were raw, vegan and super tasty. They had a good sweet salty balance going on and some interesting flavours like berry coconut chia, orange and pistachio praline, chipotle, rosemary, salted caramel and almond butter. 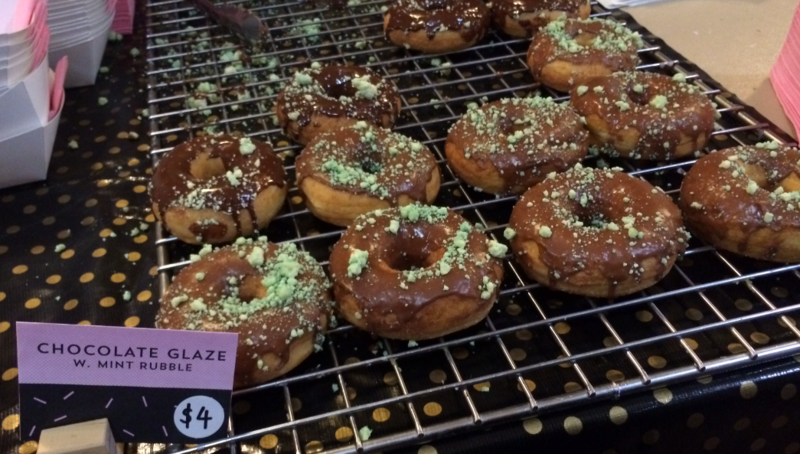 All Day Donuts had two types of donuts for sale, strawberry glaze w liquid cheesecake and chocolate glaze w mint rubble. Naturally we had to try both. They were both absolutely delicious! When we took them home Max was onto it straight away. He was sniffing around for treasure. 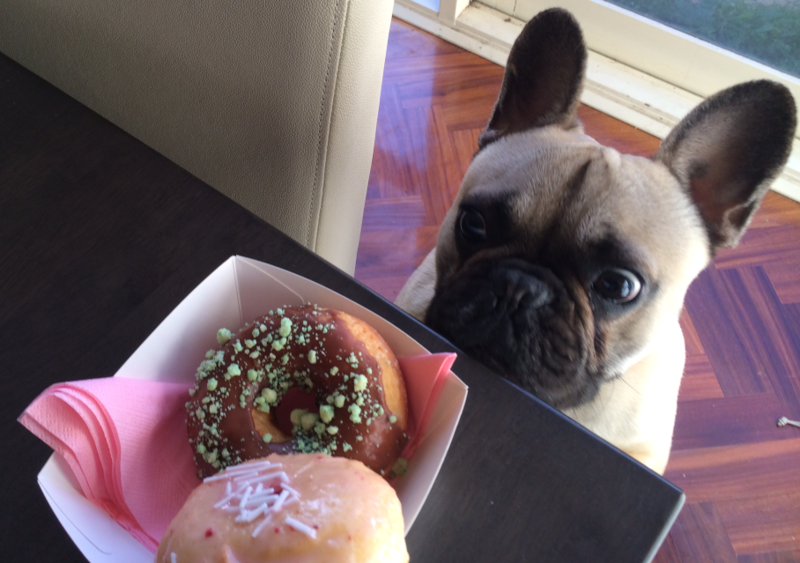 His nose knows when there are yummy treats in close vicinity. 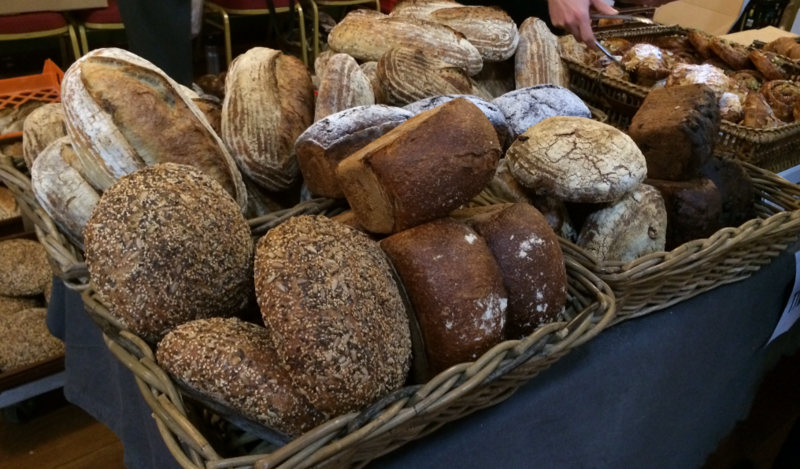 Tivoli road had some impressive looking loves of bread and a range of sweet pastries. 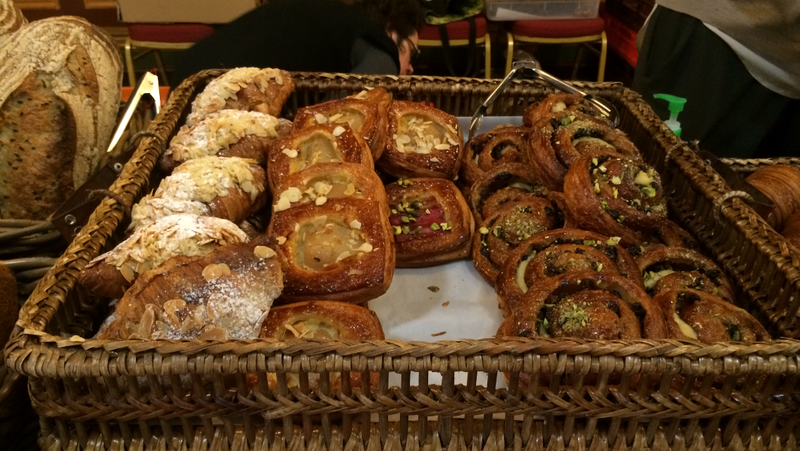 They had croissants (plain, almond and chocolate) and danishes (pear, rhubarb and raisin and pistachio escargot). They also had these cinnamon custard scrolls, which were really cinnamony and really delicious (one of my faves). 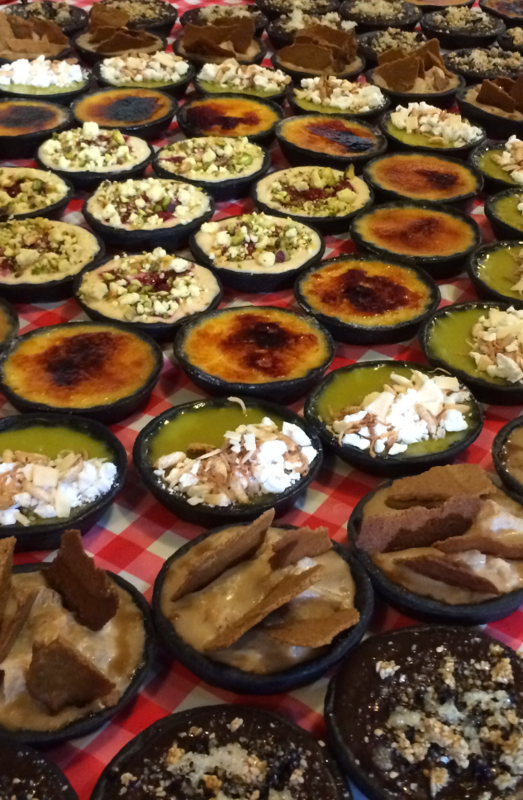 There were lots of little tarts made by Nora which had exciting flavours like lemon & lemongrass ginger brulee, coconut pandan, tamarind cream cheese strawberries, honey dark choc sea salt & sesame and quince espresso cream coconut caramel. 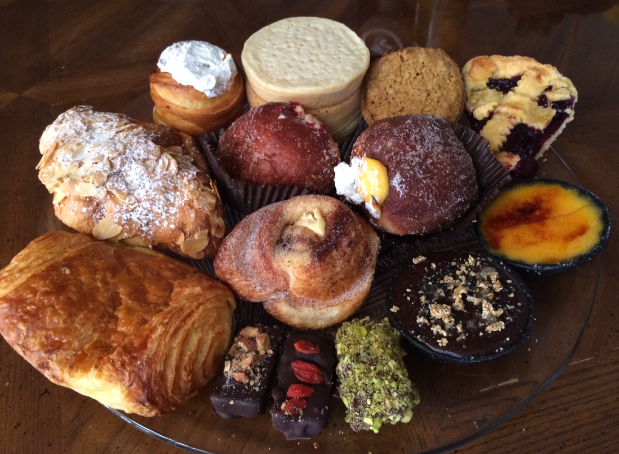 We tried the brulee and the dark choc tarts, which were amazing. 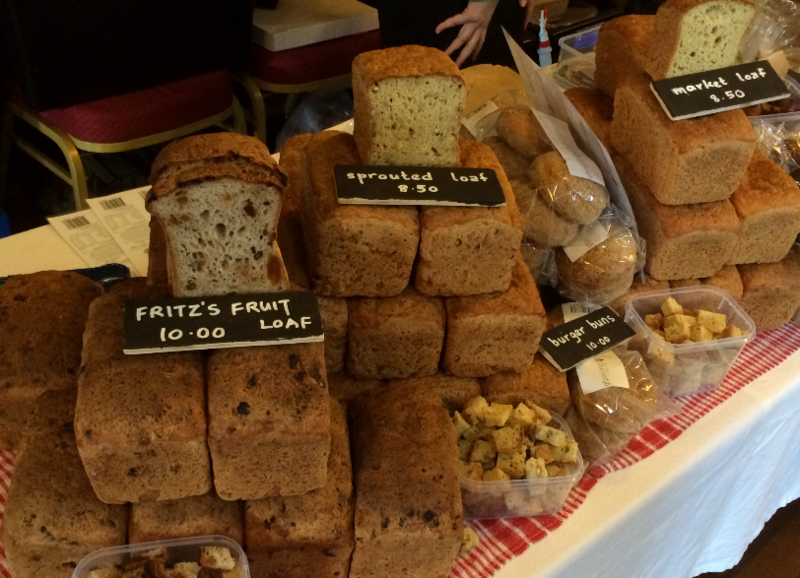 Moonbeam kitchen had a range of cakes made from scratch. They had all different cakes, which were medium sized cakes (big enough to share if you’re feeling nice but also small enough to eat on your own). They had banana cake, apply country cake, a lemon loaf w cream cheese frosting, vegan chocolate cakes. 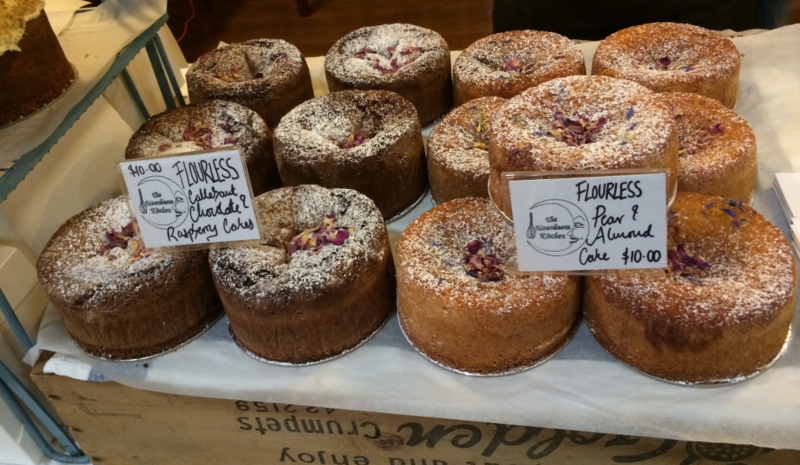 They also had a range of flourless cakes, chocolate & raspberry and pear & almond. Bakewell & Co had all different flavoured pies, they had chocolate & peanut butter, spiced pumpkin, cherry, lemon blueberry and apple. 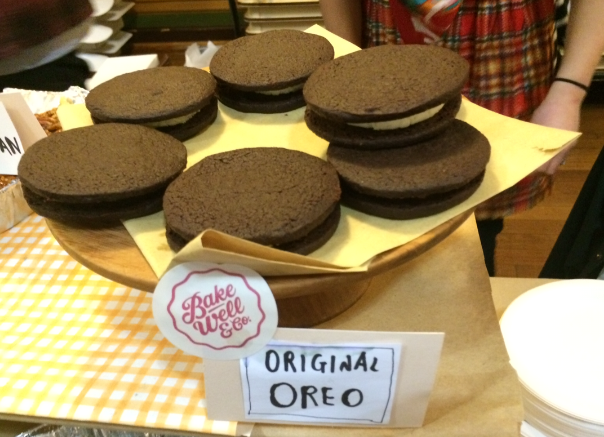 They also had assorted cream biscuits like a fresh kingston cream bisciut and homemade oreos. 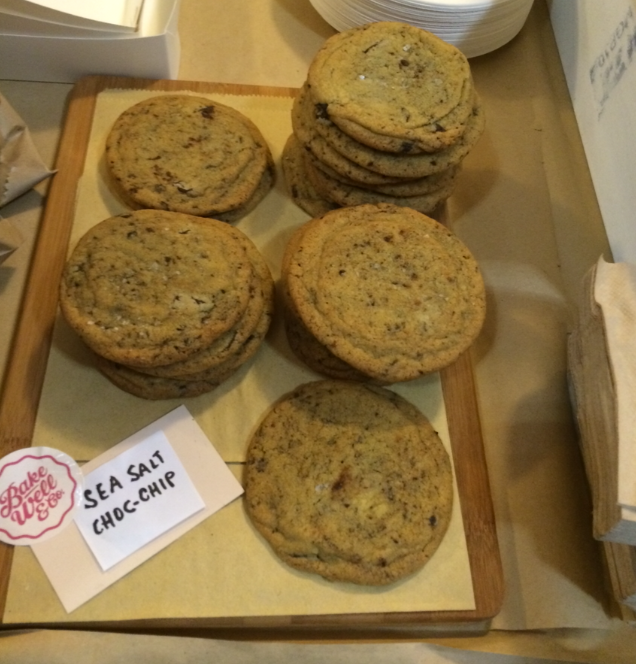 They also had these sea salt chic chop cookies which were delish. 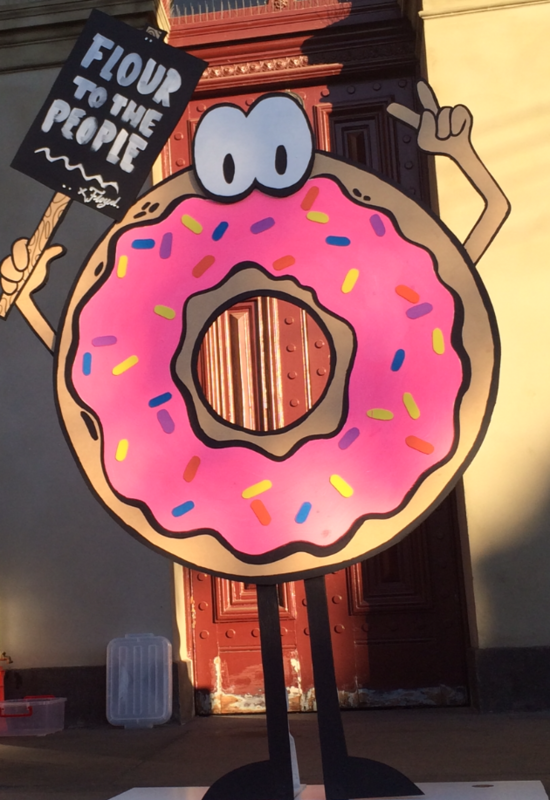 There was a stall with a variety of donuts bursting with fillings. There was raspberry lychee & rose (the rose was delightful), peanut butter & jelly (I wanted more PB), salted caramel (OMG), lime curd and meringue and jaffa. The salted caramel one was so decadent. The caramel was so rich and salty it was delicious but tasted deadly. After each bite I needed a break. They also had the salted caramel in jars for sale. This guy. Flour to the people! Love it. 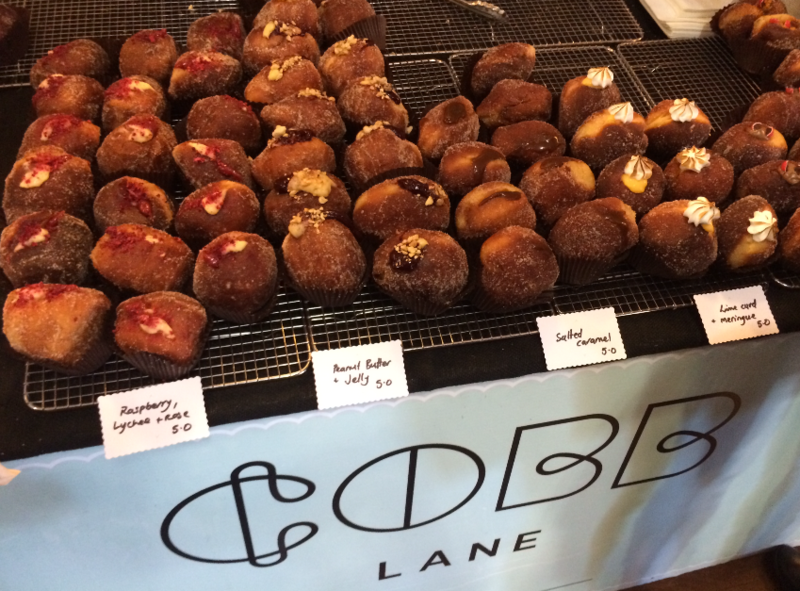 There were also some other stalls with savoury food like Pure Pie (Love their beef, red wine rosemary pie), Pierogi Pierogi (I want to try these) and Shop Ramen (Their baos looked good) but this morning I had my eyes on only sweets. At Ed’s Breads they had a yummy potato and honey loaf and they were selling slices of their bread with grilled cheese. Yum grilled cheese! I just didn’t have enough hands or coordination to hold stuff and eat hot food at the same time. We bought lots of yummy treats and it was a good thing I brought my bf because he makes a great pack mule and helped me carry all the stuff. We went to my mum’s house and had the family over for breakfast. A very sweet breakfast indeed. We toasted the Dr. Marty’s Crumpets at home and they were really yummy. They were really soft and fluffy when you bite into them. Luckily we bought the early risers tickets (only $10), which allows you to enter the bake sale half an hour before it opens at 9am. When we left there was a huge line down the street so I was glad we went early. I had heaps of fun and have definitely eaten way more than my daily intake of sugar for the day. 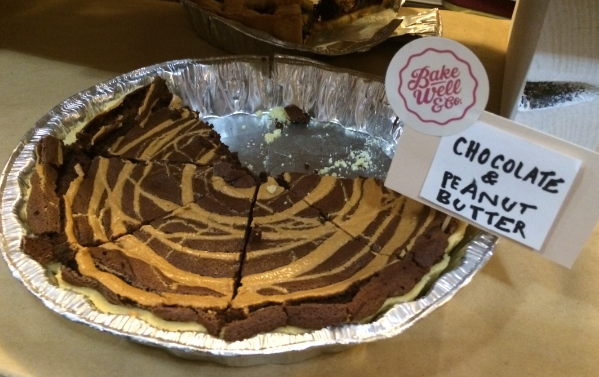 They have had a few Flour Market’s so far, so hopefully they continue these bake sales because they’re awesome! I heart the Flour Market! Pillar of salt has great food great coffee and the people are nice. It’s a cute little place with character. With a combination of brick walls, tiles and cobblestone in the courtyard, it gives the place a contemporary feel. It’s super stylish and has a casual vibe. 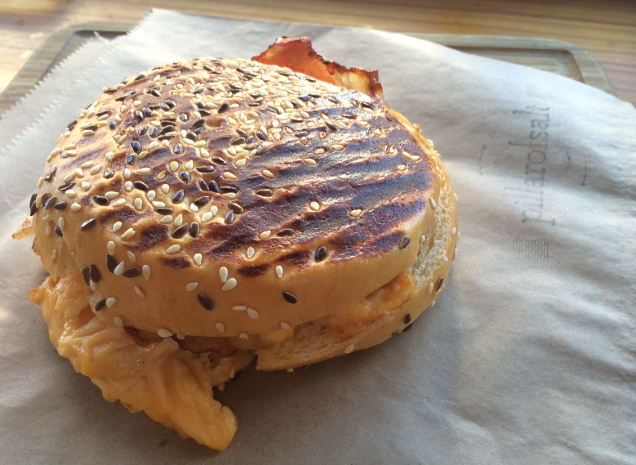 Pillar of Salt – Egg and bacon brioche burger toasted. When we first walked in there was an egg and bacon burger on display that was calling my name. I turned away, pretended I hadn’t seen it and walked straight past. I wanted something more than just an egg and bacon burger. I really wanted to get the wild Japanese mushies w avocado & goats curd crème, black sesame seeds, wasabi nori crisps & marinated silken tofu on Rye (drool) but I could not stop thinking about that burger. It looked really good and you can’t go wrong with an egg and bacon breakfast. I succumbed to the impulse and surrendered to the burger. I’m so glad I did because it tasted even better than I thought. This egg and bacon burger was especially delicious. 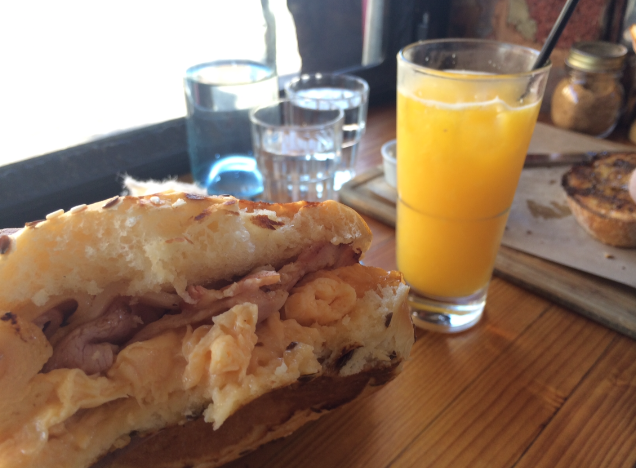 Pillar of Salt – Egg and bacon burger. There was a generous amount of egg and a good amount of bacon. The egg was sort of inbetween a scrambled and an omelette egg. It was scrambly but it didn’t fall apart everywhere so for now I’ll call it a scrambelette egg. It was yum! The brioche bun with sesame seeds took this burger to another level. It was sweet and delicious. Mmm comfort food. Totally hit the spot. 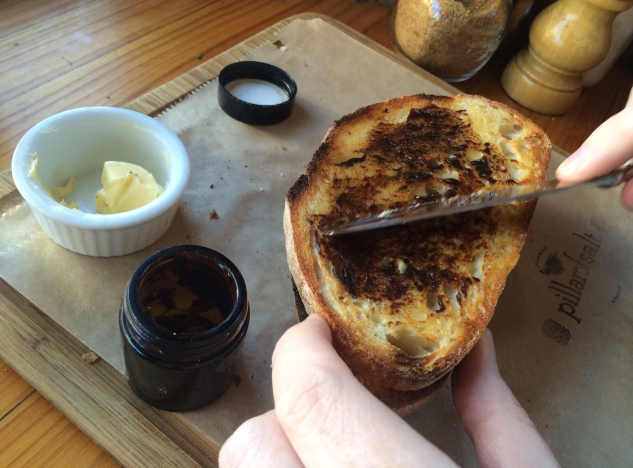 Pillar of Salt – Noisette sourdough toast w butter & Vegemite. My bf is a vegemite kid. He had the Noisette sourdough toast (really yummy bread!) with butter and vegemite. The vegemite came in a little jar, really cute. 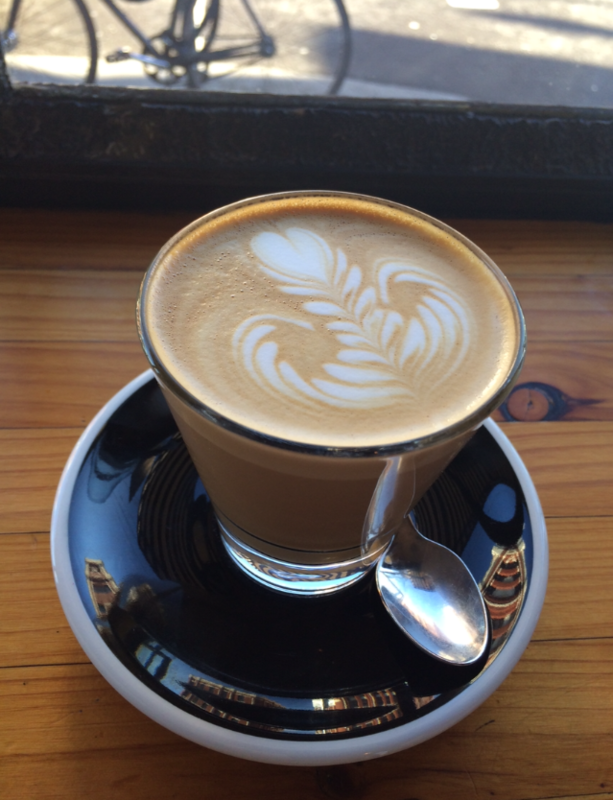 Pillar of Salt – Five Senses Coffee Yum! The coffee was damn good. It looked pretty and tasted amazing! The Five Senses coffee is local, Melbourne roasted and absolutely brilliant. Pillar of Salt – Chocolate chip banana and buttermilk loaf. 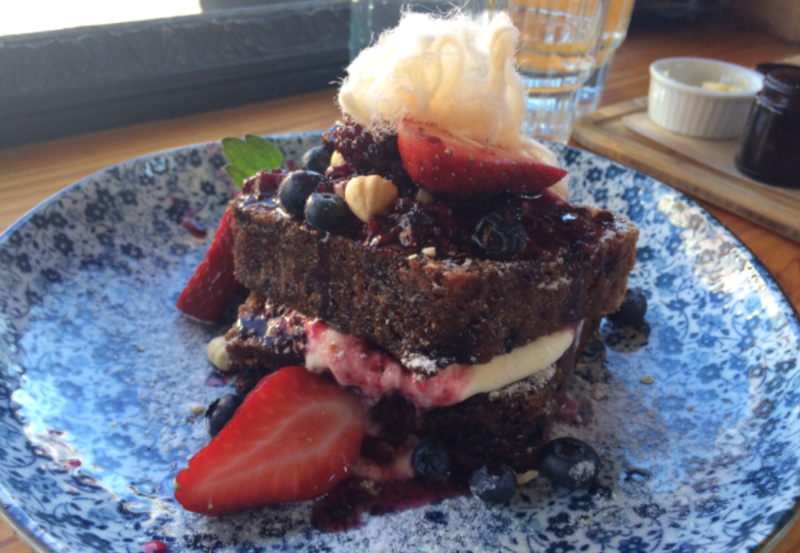 We also shared the chocolate chip banana and buttermilk loaf toasted w homemade Nutella, fresh berry coulis, double cream and Persian fairy floss. This was incredible. The super thick slices of chocolate chip banana and buttermilk loaf was toasted and the chocolate was melty. The homemade Nutella was delish and there were whole hazelnuts sprinkled on top. The fresh berry coulis was divine and there were full identifiable berries intact (I like when there are actual berries too, not just berry mush). There was blueberries, blackberries and strawberries yum! The double cream brought it all together and the Persian fairy floss was a nice touch. All the elements worked in harmony. This was really a delicious meal. As we left there was a freshly baked savoury tart sitting on the window sill left to cool. How lovely. It reminded me of those cartoons where the fresh pie/tart is sitting on the windowsill of a forest cabin and a big hungry bear tries to make off with the pie. In that moment I felt like that bear, but luckily I was already feeling very full so in this case the tart was spared. The staff were all friendly and the food was incredible. And so was the coffee. Definitely a place you will visit time and time again. It’s a really great place for breakfast, or lunch, or brunch, or for a snack, or dessert or even just for a coffee. I heart Pillar of Salt! Trading Hours: Mon-Fri: 7.30am-4.30pm, Sat-Sun: 8am-5pm. 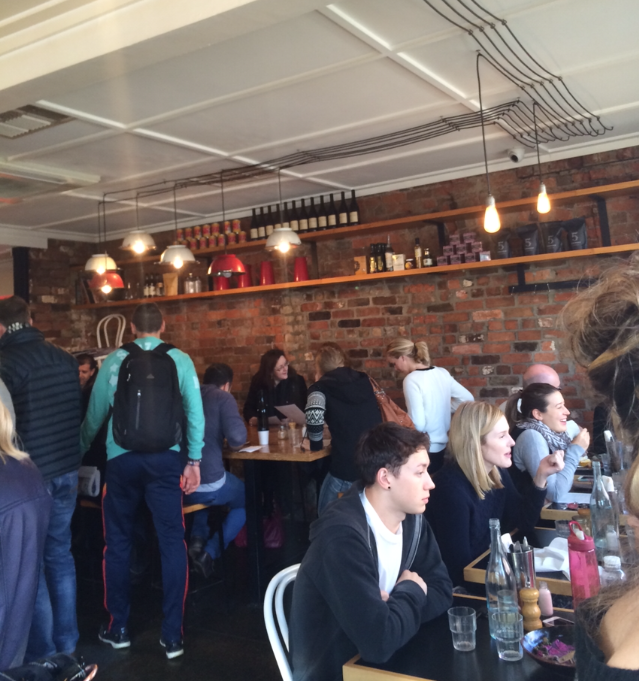 Mama’s Buoi Melbourne Pop Up – Hardware Lane. 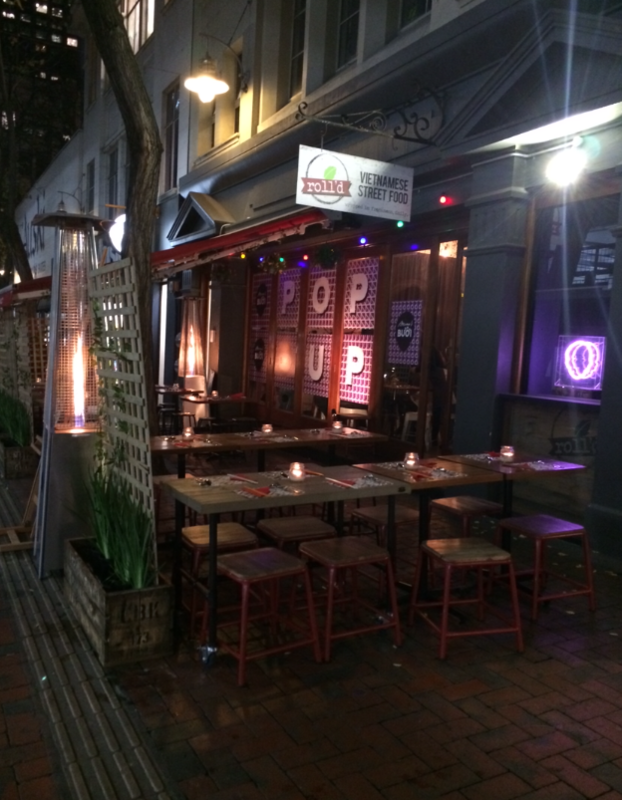 On Thursday night my mum and I were in the city for dinner and popped into this popup we found on Hardware Lane. By day it’s usually a Roll’d store, the well-known Vietnamese street food franchise and by night it transforms into a pop up restaurant called Mama’s Buoi. Turns out, Mama’s Buoi is made by the same people who created Roll’d (Ahh it all makes sense). The menu is still authentic Vietnamese food but the style is more of a dine-in restaurant version. The prices are still pretty cheap though and the food is just delicious. 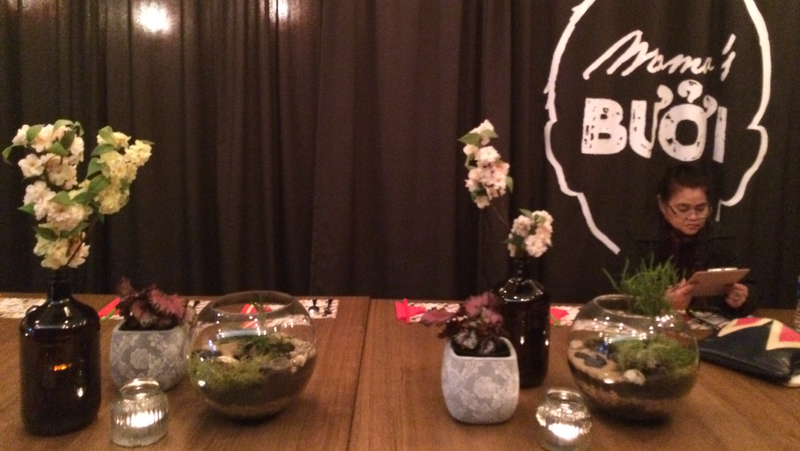 Mama’s Buoi Melbourne Pop Up – Pretty vases w pretty flowers. It’s was nice inside the décor was modern. There was a big table in the center of the room with contemporary Asian inspired vases with beautiful flowers. You can see my mama under the sign engrossed in the menu options haha. There is also an outdoor eating space with heaters. 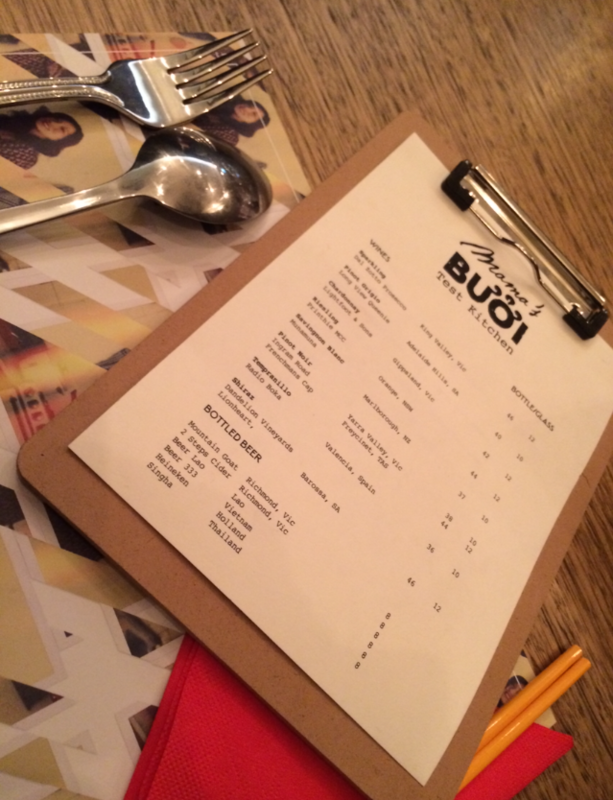 Mama’s Buoi Melbourne Pop Up – Drinks menu. They had a range of drinks on the menu including a list of alchoholic beverages. They were also trialling different cocktails each night so maybe ask them what cocktails they have available. We ordered the crispy whole flounder, which was crispy on the outside and perfectly soft in the middle. The fish effortlessly fell away from the bone. It was cooked perfectly. It had ginger, chilli and caramelised onions with a limey Vietnamese dressing. It was delicious! 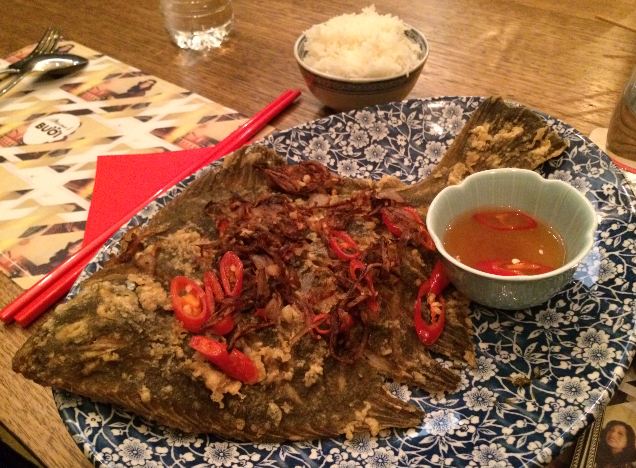 Mama’s Buoi Melbourne Pop Up – Tasty Vietnamese food. The meal came with a complimentary bowl of rice, which was perfect because that was the next thing I was about to order. My mum was sad there were no fish eyes (she says they are usually plump and delish). I on the other hand was pleased there were no fish eyes eeeww! 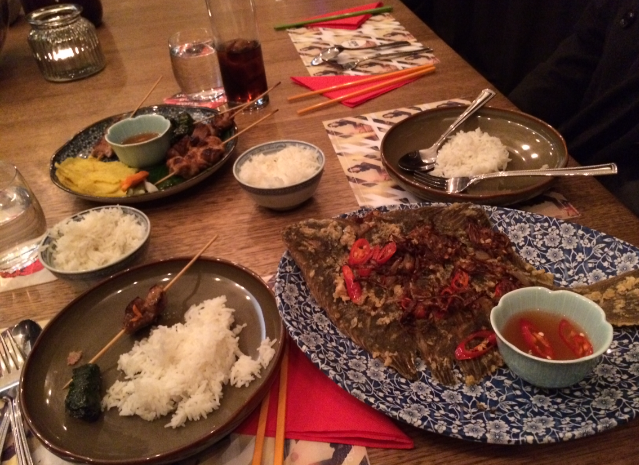 Mama’s Buoi Melbourne Pop Up – Small Share Grill – Assorted skewers w crepes, pickled veg and nuoc cham. 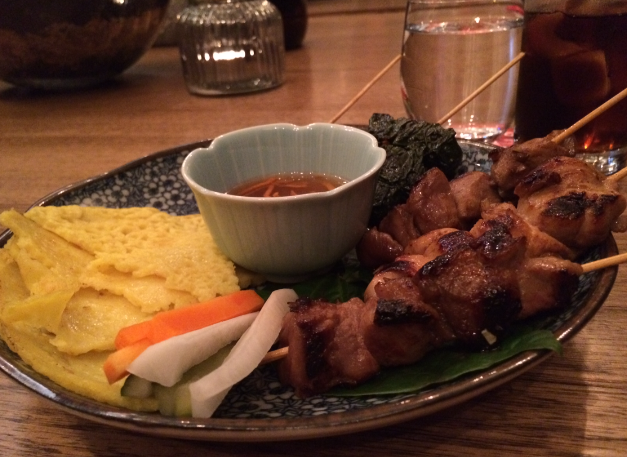 We also got the small share gril, which was a share plate with a variety of skewers. There was pork, chicken and sausages wrapped in betel leaf. They came with crepes, pickled vegetables and Nuoc Cham sauce. They were really yummy, the pork one was my fave. All the food was really tasty. I really wanted to get the coconut mussels, crispy fried prawns, the beef vermicelli salad and the sautéed water spinach but I was already so full. Just means I’ll have to go back. The pop up is there until the 4th of August but don’t worry, they will soon be opening the actual restaurant at GPO. Did I mention that the staff were really lovely? Well they were. Definitely worth popping by.